Obstruction: To B or Not 2B, or Whose Time is it Anyway? Umpire Adam Hamari ruled obstruction Sunday as Joe West contained Reds Manager Dusty Baker in a case of a wild pickoff throw turning into an extra base, courtesy of Cincinnati's premature play termination. With one out and Padres baserunner Will Venable on second base, Reds pitcher Mike Leake attempted to pick off R2, but instead threw the ball into shallow center field as shortstop Cesar Izturis lunged after the errant throw in vain, landing on top of Venable, who had slid head-first back into second base. Venable, realizing his situation, attempted to rise and advance as Izturis delayed and impeded his progress, drawing an obstruction call from 2B Umpire Hamari. obstruction call by 2B Umpire Adam Hamari. Obstruction is the act of a fielder not in possession of nor in the act of fielding a ball impedes the progress of a runner. Rule 2.00 (Obstruction) Comment clarifies when a fielder may considered in the act of fielding a ball, stating that after a fielder has attempted to field a ball, he is no longer in the act of fielding the ball. As example, the rule cites the hypothetical: "an infielder dives at a ground ball and the ball passes him and he continues to lie on the ground and delays the progress of the runner, he very likely has obstructed the runner." Question: Replays indicate Izturis obstructed Venable, but did Hamari rule Type A or Type B, defined by Rule 7.06? (a) If a play is being made on the obstructed runner, or if the batter-runner is obstructed before he touches first base, the ball is dead and all runners shall advance, without liability to be put out, to the bases they would have reached, in the umpire’s judg- ment, if there had been no obstruction. The obstructed runner shall be awarded at least one base beyond the base he had last legally touched before the obstruction. Answer: As specified above, the key criterion to consider is whether a play was being made on the obstructed runner at the time of his obstruction. Even though Venable was the only runner on base at the time of obstruction, the ball was loose in the outfield and a play was not being made on the runner at the time of obstruction. This is an example of Type B obstruction (also MLBUM 41.2-3). Replays indicate Hamari correctly identified the latter version of obstruction by pointing at the infraction and keeping the ball alive and in play (had this been "A" obstruction, Hamari would have raised both hands, as in calling "Time"). However, both Venable and the Reds fielders' actions indicate the players improperly believed the ball was dead at the moment of obstruction. Had Cincinnati realized the ball remained alive during the officiated 'B' obstruction, an out likely could have been recorded (however had Venable realized the live ball situation, he likely would have remained at 2B). Whose Time is it Anyway? Not the umpires', who correctly kept play alive until Venable reached third. Good call. I will say Joe West went out and protected his crew man who made the right call. But how do the Reds players not know this rule at that level. They could of easily gotten an out he Dan neat walked to 3rd. He wouldn't have been out at third because Hamari would have ruled had he not been obstructed he would have made third. Great call....Dusty Baker and his players look like clowns arguing this. Whether right or wrong, I think the argument is that there was no impeding of progress. I like the call but can see it both ways. The Reds will argue that there was no impeding and that it was inadvertent contact initiated by both parties. The fielder WAS trying to field the ball when he (barely) fell on top of the runner. Smart move by Veneble to fake like he is going to get up and run, because that bought the call. @btumpire I do not believe he would of protected him to 3rd. Unless he was thrown out by a step or two but with him walking he would of been out by a mile. Just because you call obstruction does not automatically mean he gets the next base. That is only in hs. Pro rule which was labeled out in this post you protect the runner as far as you think he would of gotten had no obstruction occurred. Dd4d see what I posted back to btumpire. At school we would still had to have called the obstruction but I would of protected him back into second Jay because he got up and went towards 3rd doesn't mean anything. Think of this as the f3 bumps br you call it but now he is thrown out by 5 steps at 2nd yes you got obstruction but you still have an out. High school rules you get 1 base no matter what? Yes 1b beyond the last legally touched base. It's one of the stupid differences. 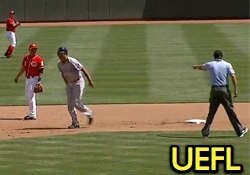 And of course MLB.com labeled the video "Venable moves up on interference." Can't tell when Hamari DID call time. Clearly type B obstruction and Hamari does not immediately call time - but the play is supposed to "proceed until no further action is possible." No one makes any effort to throw to third and Venable just walks to 3rd. Since he made it to third on his own, I can see why Hamari awarded him third on the obstruction; but if the Reds had played it out and thrown to third, I can only see him being protected back to second. Is the only reason he's protected to third? because he made it there before time had been called? In other news, best crew chief ever. I don't beleive Hamari called the obstruction on Izturis when he fell on the runner as he was reaching the for the ball (incidental contact). The obstruction call comes when Izturis trips the runner as he is starting to run. That is the obstruction call. Therefor because of the trip (the time it takes a runner to get up off the ground, recover and run) you are most likely protecting him all the way to third. Opinions? Lets hear it R. Sudmyer! The only times there is inadvertent contact is when there is a play being made, or when the ball is dribbled out in front of the plate with the catcher and runner colliding. Everything else is either interference or obstruction. In this play, if they threw to third and the runner was out by a lot because he was jogging, he would have been called out.